As everyone from the movie’s publicists to bloggers reviewing this film for the first time have pointed out…”The Squeeze” is a golf movie with characters that really can play golf, meaning they don’t look like Dr. Molly Griswold in Tin Cup. Now it’s true the “Tin Cup” character played by Rene Russo wasn’t supposed to be a golfer but somehow her contraption contrived swing didn’t look that much worse than the passes Kevin Costner was making…even after coaching by the likes of Gary McCord. The point is, it’s nice to have golfers playing golfers in a golf movie but absolutely irrelevant if they can’t act. 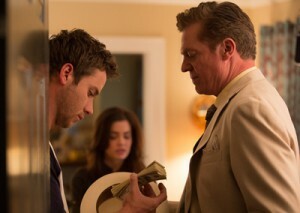 The story of “The Squeeze” is based on what actually happened in real life to a young man played by Jeremy Sumpter (“Peter Pan,” “Friday Night Lights”) when he gets taken under the wing of a big time gambler named Riverboat played by Chris McDonald (“Happy Gilmore,” “Thelma and Louise”). Sumpter playing Augie is a small town golfer that doesn’t know how good he is but recognized by Riverboat as having the skill to win high stakes matches. They wind up in Las Vegas (where else?) for a million dollar match against the reigning U.S. Amateur champion played by Jason Dohring over the ultra-exclusive Wynn Las Vegas golf course. 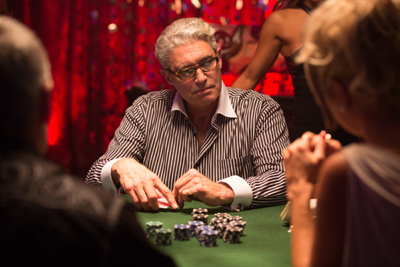 Dohring’s character’s sponsor is called Jimmy Diamonds and as played by Michael Nouri becomes easy to hate. He threatens to kill Augie if Augie wins the match and while Riverboat makes the same threat should Augie lose. 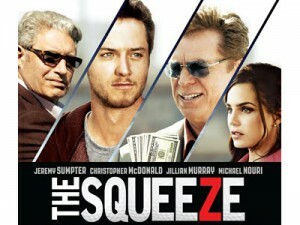 Hence the movie’s name, “The Squeeze”. And, to put my readers on notice, if you don’t want to know in movie ending you should stop reading. Obviously our hero Augie has to get out of this lose-lose situation and does with the help of his girlfriend Natalie (Jillian Murray) by double crossing Riverboat and Jimmy Diamonds on the 18th hole. The movie’s climax takes place in the desert outside Las Vegas with Augie and Natalie holding the two gamblers at gunpoint before driving away leaving two briefcases. One filled with $2 million and the other a loaded automatic. As the happy couple drive away a single gunshot is heard, the outcome of which is left to the viewer’s imagination. It’s an old saying that to make a good movie you need two things primary things namely a good story and good acting. This combination is found in “The Squeeze” and for golf fans there is much to recommend seeing it. The story moves along with a minimum of distractions with the final match and Augie’s double cross being extremely well done leaving the outcome in doubt until the final few minutes of the film. ”The Squeeze” will be theaters as well as VOD and on iTunes on April 17, 2015. Even non-golfers will enjoy it.